Square Enix is releasing a “classic outfit” for Shadow Of The Tomb Raider that still isn’t what fans of the old games want. Shadow Of The Tomb Raider was fun and occasionally thrilling with its puzzles, platforming, and extensive difficulty options, but its characterisation of Lara Croft was again a disservice to the British heroine. While there’s no denying the modern reboot trilogy had fantastic visuals and stellar action, Square Enix ultimately turned it into a meme by marketing each installment with “become the tomb raider”. Lara’s prolonged transformation into the tomb raider was clunky, and judging by this “classic outfit” Square Enix still don’t know how to recapture the sorely missed icon. Per the official Tomb Raider Twitter account, Eidos Montréal and Square Enix are releasing a new Tactical Adventurer Classic Outfit on April 23. It’s essentially a teal and brown retexture passed off as “classic”. How cute. As you’ll quickly see from looking at the responses, fans aren’t pleased about Lara again wearing trousers instead of shorts. To outsiders, this complaint will seem incredibly petty, but the clamouring for Lara to once again don shorts is simply fans wanting her to no longer be the sniveling and naïve impersonator they’ve had to endure for more than five years. 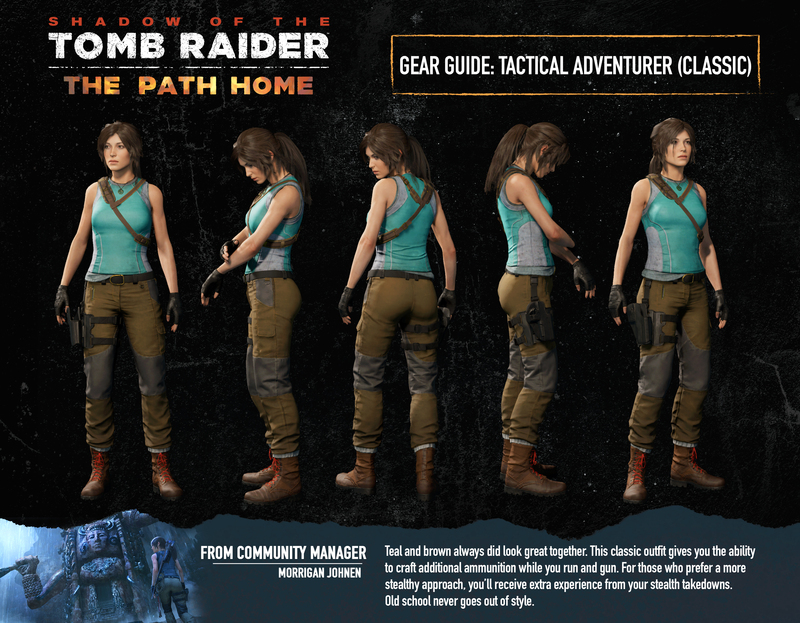 If it’s a “classic outfit” made for the old-school fans (the only ones who have bothered to stick around to complete Shadow Of The Tomb Raider’s extensive DLC), then why not have her wear shorts? No one would be blinded or offended by the sight of Lara’s bare knees, and no one would care about the “realistic” dangers that would come with wearing shorts in the jungle. Yes, wearing trousers is more practical, but it’s also boring and fans don’t want to keep seeing Lara wearing her deceased dad’s clothes for “serious realism”. Honestly, it’s just sad when fans are able to come up with a real “classic outfit” that – unsurprisingly – makes Lara look cooler and more of a badass than the modern reboot. With there likely being another Tomb Raider game in the future, maybe Square Enix will eventually lighten up and give fans what they want.